The onslaught of data is upon us and marketers are struggling to harness this amazing opportunity. KONY 2012 is the world’s fastest shared video ever (over 40MM in 3 days). It came from the advocacy group Invisible Children and promises major social change. The rise of the socially-empowered society is here. This may be the year that content marketing explodes, so we must take a hard look at the data behind it. We must understand the what, why and how of content marketing. Competitive intelligence here will be as important as already established competitive intelligence of traditional media. As competition heats up, marketers cannot afford play games with their content marketing efforts. This requires an understanding of audience preferences on what content to post, in what format and when. There’s a staggering amount of valuable insight to be learned just by looking at a brand’s audience and their behavior. In our previous post: 3 Ways to Transform Social Analytics into Actionable Intelligence, we address the key data sources marketers should be utilizing to achieve greater campaign efficiency. While brands have looked at competitive intelligence for traditional media for decades, they’re currently myopic in terms of how they’re looking at their social and content marketing performance. For brands to be more competitive, they need to have an understanding of what the benchmark of success across their industry is and what trends are behind the data. Strategic planning requires a deeper level of insight over simply looking at your own following and trying to increase engagement and fan growth via trial and error. Facebook analytics is great; however, it’s just a fraction of the true potential audience out there. When you’re using the population of fans of 25 brands in the same industry, this larger sample size leads to true insights about how fans engage in the category. Content has a half-life on Twitter of less than two hours, whereas Facebook is slightly longer; but due to Facebook’s Edge Rank, post visibility is attenuated to your followers. (see Relevancy Meets Passion: 5 Ways To Increase Post Relevance) One of the most valuable insights is how a brand ranks by what TYPE of content is being created and the level of engagement that they are obtaining. You must look beyond your own brand, and yes “the grass is greener on the other side” in this equation. You have genius moments, just not every day. But the “crowd” has continuous genius moments all the time. Post engagement is one proven way to determine relevance. Here we have top couture brands revealing it’s not how much you post but what you post about that matter. We can see that Chanel is killing it with engagement on very low post volume. No longer is the brand a set of campaigns when the customers flow from one competitor to another and brand loyalty is more difficult than ever. Consumers have the POWER with one click to broadcast their actions globally. How does a brand continuously keep up with 3.5 Billion pieces of content shared per week by millions of users? Your audience can tell you a great deal about your brand just by monitoring what they do across social media. It’s a living, breathing organism, a constant feedback loop, and the biggest focus group you can ever assemble- a focus group that doesn’t know you’re watching it, and doesn’t throw off the results by trying to please the researchers. In other words, this is the best focus group you’ve never had. Discovering what’s trending across many similar brands allows you to ride wave at its peak and makes you the smartest person in the room. 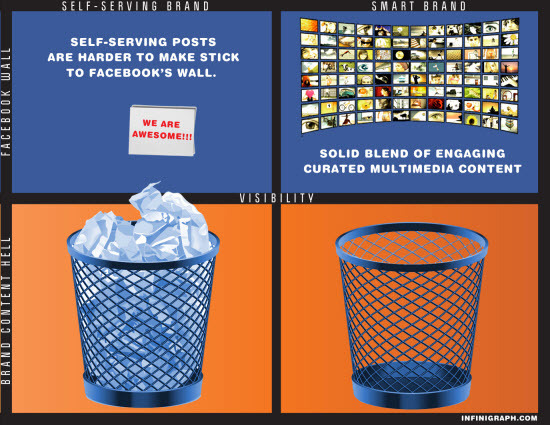 All brands suffer from “post engagement atrophy”: a few posts get traction and all others fall off rapidly. Understanding your audience’s content preferences requires looking across many brands simultaneously. What you think the consumer likes vs. what they really resonate around can be vastly different. This is why brands must keep on top of what’s trending within their industry or suffer. We come from an industry accustomed to having creative and strategic people spend months understanding their target market and more months crafting the perfect message. The shift in how consumers want to be communicated with means that we must understand them immediately and react in real time. This is a challenge for content marketing because we obviously can’t just keep guessing at what the audience likes. We need to let them tell us. Content performance is critical. We found that the different industries, different days of the week, and type of content all affect the level of audience response. The take away is that optimizing based on just your brand intelligence is not good enough. We’re seeing daily a shift happening on how consumers interact with content is a way that wasn’t expected. Depending on the industries, content engagement patterns are vastly different. 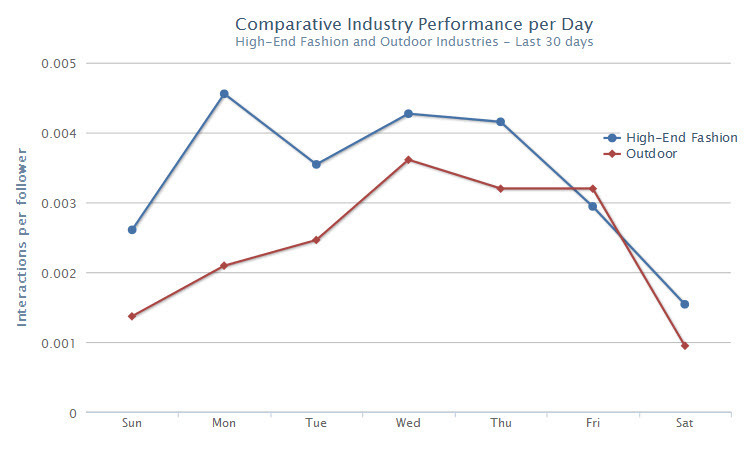 We did comparisons on outdoor apparel to high fashion couture and found different content types achieve greater engagement on different days and times. A key take away is your content calendar must be tuned to the audience overall and not based just what your own internal analytics is telling you. What type of content drives the greatest level of engagement for your industry? Content performance varies month over month and looking over many brands provides better insights. Collective content interaction provides a high degree of measurement to determine what audience preferences are. A great deal of information must be parsed to capture the trends. You must look beyond your own brand to understand what makes your consumers engage. Knowing what brands are driving the greatest interaction per post provides a clear point to monitor what type of content is creating the most action is a clear indication to what should be budgeted. Content curation is a low cost path to amplifying site engagement if you can’t create the all of your own content yourself. Furthermore, by increasing consistent engagement, your post visibility increases. For every 1 brand post around your product or sales a minimum of 3 to 5 related to topics each week is recommended. The most valuable insight ongoing is where a brand ranks by the type of content being created and the frequency of this engagement. Different content types have higher engagement on different days and times. Knowing your audience’s consumption habits and altering the content calendar based on how the industry performs is a way to make huge gains in performance, even without increasing your content budget. The new Facebook Timeline is not going to make people come back to a Facebook page. Facebook marketing success is about quality of content and the ability to induce consumer’s engagement. Keeping an eye on those top performers and what they are doing is your best bet to crowd source those genius movements. Remember the majority of people have not seen the majority of content. Competitive Brand Intelligence - Brands require insight not over a few millions of people but 10’s of millions because the majority of followers are not active with just one brand. Looking at your own social presence is not enough. Using the collective behavior around many brands within your industry generates insight to drive critical decisions for every campaign. Using logic as a guide to consumer interaction is a big deal. First off, take the guess work out of the why and what. Let’s face it, there are many ways to interpret this data and it should be noted that statistical averages are the best way to determine an optimal type of content and fundamental drivers for your content calendars. Leveraging collective crowd interaction yields a higher degree of certainty to what makes the audience tick. Brand that are stuck in the ME ME ME world suffer because the audience wants to have content that is share worthy. Brands need to get over themselves; the days of them controlling the conversation is OVER. Recently, the figure being tosed around at the Facebook Marketing Conference (fMC) was brands has an average 16% engagement on posts, however,, where we see more like sub 1-5% post engagement. Consumers who are active on brand posts have an overall nature to share content from other sites. Those brands doing Curation are more aggressive because what’s going on with Facebook Edge Rank. How successful are brands at content marketing? As we stated the majority of people don’t see the majority of content. This really important fact plagues every content marker who ask the question “how do we increase more engagement?”. What was the largest share you have seen? 100? 10,000? 100,000? Interactions out of what a billion people socially connected? That only a sub fraction that said it was good content. However, knowing a similar audience indicated quality is a great example of what others would possibly find valuable too. Furthermore, even the leaders in content marketing can be doing much, much better through optimization. Right now they are simply leading a turtle race. Content discovery is now a critical part to maintain a competitive advantage. Content marketing has proven to be an effective tool in increasing sales for brands, while establishing them as the thought leaders in their industry. Those brands doubling down like Burberry — willing to spend serious cash on digital marketing because they believe that by using the medium creatively it can attract future customers will continue to dominating the voice of their industry. Marketers are making a smart, pivotal move to social content and this requires more content intelligence. You’re hard pressed to see a TV commercial where there’s not a Facebook URL and now Twitter tags being used too. Directing consumers to a more integrative experience that in turn drives share behavior leveraging the full force of a fans social graph. And when all else fails, just use cat pictures. What strategies are you using to tap your audience’s passion points? Not connected with us? Our Pinterest, @InfiniGraph, Facebook page and Google+ Page welcomes you. Yes, please LIKE it if you’re into great content intelligence, digital strategies and increasing conversions. This entry was posted in Content Marketing, Social Media, Thought Leadership by admin. Bookmark the permalink.